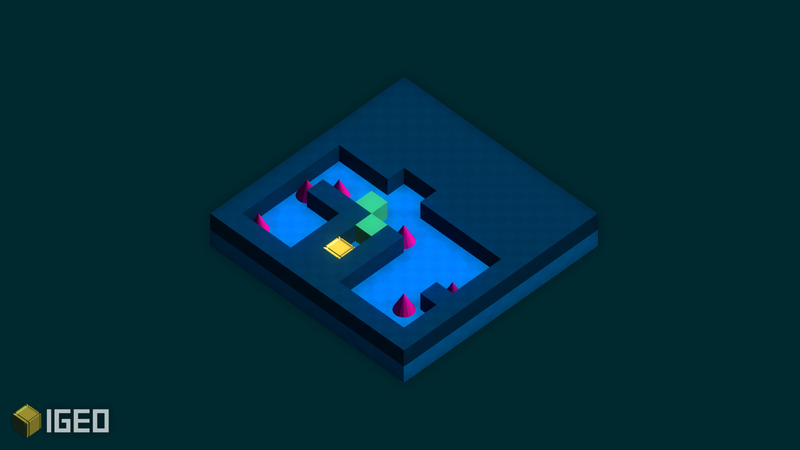 A puzzle game with an abstract visual style. The goal is to eliminate all blocks from the board by moving them into one another in various ways. Some blocks have unique properties when combined. Originally built for Ludum Dare 35 in way under 72 hours (close to 24 hours total work time). Since the closing of that contest we've been spending time polishing the game's visuals, UI, and sounds. We'll be releasing 20 standard levels for Early Access in September 2016 and plan on exploring potential 'special' game modes and new features after some initial feedback. You can play the 'Post Jam Alpha' version of the game right now at IGEO on itch.io. As I've spent the last couple days working on levels for the game, one thing I've noticed is that it is going quite quickly. Puzzle games like this are often easy to design for but more difficult to test. The balance I'm finding is that the puzzles are super simple to solve when you just got done laying them out! So, this early access period in September will really, really be to gauge not only performance - but challenge. I want the game to start off rather simple and by the last 5 to 10 levels be very difficult. In the final version of the game, I'm wanting 70 to 80 levels, so I'm shooting for a modest completion time of around 2 - 4 hours, depending on how fast you can solve each level. Currently, I have 12 of the 20 levels that I had planned on for the September release. With a little more time to spend (if music production speeds up), I may be able to get an additional 5 or 6 levels in the release. Fingers crossed! As for the music, the production of IGEOs soundtrack has been going slow. I've never worked on music for a puzzle game, so I'm really struggling finding a unique but laid back vibe for the tunes. I think I just need to find some inspiration online and take a minimalist approach. Often, in music production, it's easy to get carried away and thinking that complexity is synonymous with musical quality. I'll also be working on a trailer for the game in the next couple days that will definitely be showcasing the music and some more of the Early Access levels. Implemented the settings menu with some quality, post processing, and movement options. A post-jam alpha featuring some special FX and no sounds. Congrats! You should be in good shape for the new levels!